The most important aspect of the wedding is ensuring that the logistics of the wedding and various technical and production aspects are handled with ease and care. However, given that people plan a wedding only once in their life, planning an event for those many number of people can be a daunting task and a logistical nightmare. Small details can be left out and large plans can be botched by lack of experience, stress and lack of industry contacts. To ensure that this doesn’t happen, it is best to let professionals handle the technical and production aspect of the wedding to ensure that the wedding is a complete experience for both the wedding party and the attendees. Rachoutsav, with its Technical & Production package ensures a beautiful, well planned and well executed wedding without the hassle of actually planning or executing one at extremely economical rates. Stage and Seating: We know how important it is to maintain the spotlight on the happy couple while ensuring that the guests have good and comfortable seats with a beautiful view of the wedding ceremony. 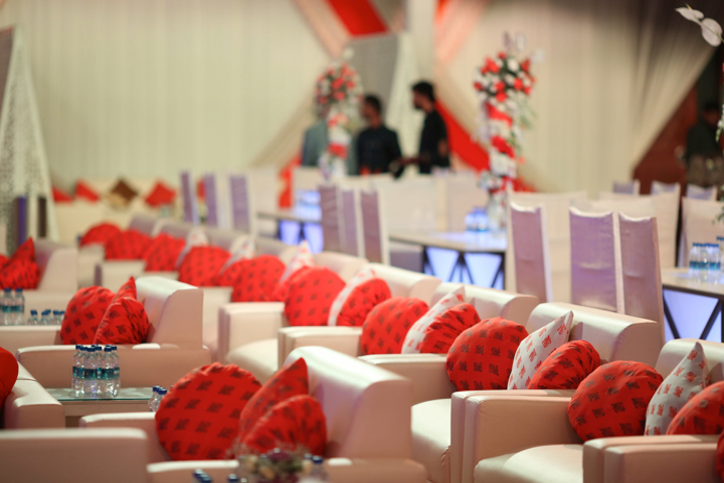 With our detailed planning, a beautiful stage for the wedding and lovely seating options are definitely guaranteed. Lighting: Lighting can make or break an event. Too dim, nothing is clear and the photos turn out terrible. Too bright, and everything looks tacky and impossible to enjoy. With our plans, the wedding will feature the best lighting options ensuring that the visuals remain impeccable. Sound and Acoustics: Many weddings have functions that require good sound and acoustics without reverberation and absorption. For instance, a sangeetfunction may not be much fun if the peppy music that the DJ plays cannot be heard. Our sound and acoustic detailing will ensure that whether it be the voice of the emcee, or the speech of the father giving a loving speech, everything can be heard crystal clear by the guests and be recorded on video. Staff: Most families are willing to help out in a wedding and will go out of their way to ensure that the day remains special for the bride and groom. However, despite the best efforts of the family, manpower often runs short during weddings. With our package, not only will there be someone with considerable experience to handle every aspect of the wedding, but the family will get to relax and enjoy the wedding without worrying about getting things done. With our Technical & Production package the wedding will undoubtedly be a happy one.